Children with Type 1 diabetes have only one option to control their blood sugar: insulin treatment. Ravaged by an autoimmune disease that attacks their own pancreas and islets—microscopic clusters of cells that sense blood sugar and produce insulin—patients are forced to rely on insulin from an external source. "The absence of this natural ability—minute-to-minute regulation of glucose levels—can result in long-term complications, such as blindness, amputation and kidney failure," says Klearchos Papas, Ph.D., a professor in the Departments of Surgery and Medical Imaging at the University of Arizona College of Medicine—Tucson. "Even with automated insulin delivery devices and continuous glucose monitoring—the best way possible to control your blood sugar—you still can end up with these consequences." Dr. Papas adds, "Interestingly, if you administer insulin aggressively to help lower and keep your blood sugar in the normal range, you actually increase your risk of potentially deadly hypoglycemic, or low blood sugar, episodes." Now, with a two-year, $1.2 million grant from the JDRF, Dr. Papas will continue to perfect and test his device in preparation for clinical trials in humans. The project, which also includes a contribution from Novo Nordisk, is in collaboration with Tom Loudovaris, Ph.D., of St. Vincent's Institute, and Greg Korbutt, Ph.D., of the University of Alberta. Eventually, these islets begin producing insulin for the body, but in order for the patient's body to accept the transplanted cells, the patient must take lifelong immunosuppressive drugs. "The need for lifelong immunosuppression is a major concern," says Dr. Papas, who leads the UA Institute for Cellular Transplantation. "Children would be more susceptible to infections and lifelong treatment could cause other serious health conditions." To avoid immunosuppressive medications in children and adults, Dr. Papas' device can protect transplanted insulin-producing islets from the body's attack. Donor islets are placed inside of the implantable, tea bag-like device, which has a special exterior that shields the islets from any attacks from the immune system. "It's like a tea bag," Dr. Papas says. "The tea leaves stay inside but tea, or insulin, comes out. And the tea bag keeps out the immune cells that would normally attack the islets." Such tea bag technology has been explored for decades but has not yet made it to patients for routine clinical use. One of the key issues that has limited the technology's success is the large size of the tea bag—at one point analogous to a large flat-screen TV. "The unique thing we bring to the table is the combination of an optimized tea bag with its own oxygen supply," Dr. Papas says. "Islets are happier with an oxygen supply; they survive and function better and this has been overlooked in the past." Under current plans, the oxygen generator—the size of a stack of quarters—eventually will be implanted alongside the islet tea bag. Implant locations include under the skin of the arm or back. The oxygen generator, which will use battery power, could be recharged without wires or removal from the body using a technology known as transcutaneous energy transfer. "This is not pie-in-the-sky crazy science," he says. "We believe, engineering-wise, it is achievable. The cells and the biology were the difficult part and they have come a long way in the past five years." 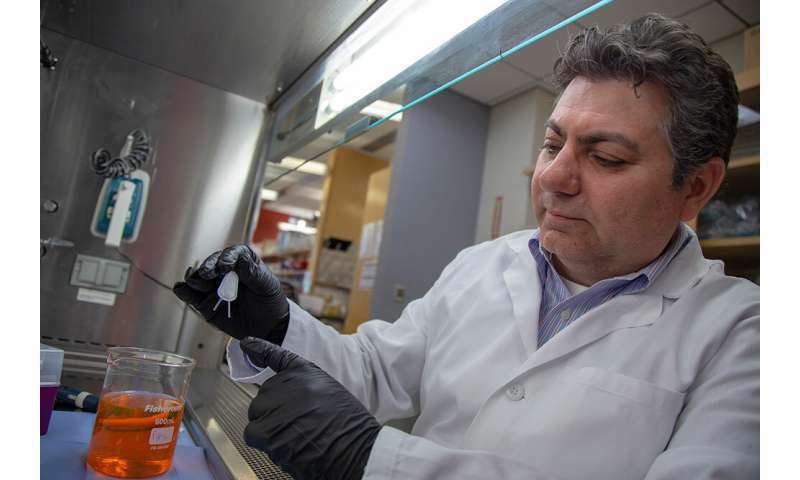 If taken to market, human islets from donors will be placed in the tea bags, but Dr. Papas believes that islets generated in the lab from human stem cells soon will be available. As part of the two-year study, Novo Nordisk has donated human stem cell-derived islets to test in the tea bags. If successful, stem cell-derived islets would make it easier to help treat the millions of people with diabetes. "This is an incredible example of the kind of innovative and collaborative research that is taking place on the UA campus that has only recently become possible with the convergence of the physical, biological and digital worlds," Dr. Robbins said. "The work that Dr. Papas and his team are doing to help children with diabetes is a great example of using new technology to significantly improve quality of life for patients, and why the UA is primed to be a leader in developing digital health."